One of the ways to improve altimetry resolution is to use several satellites at the same time (see Multiple satellite for high-precision altimetry). Until now, this has been done with very different types of satellite. The use of several identical satellites in constellation could reduce costs (development costs, and launch costs too for micro-satellites launched by the same rocket). 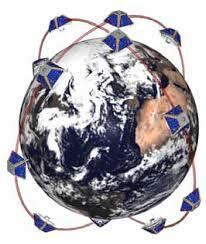 The questions to be solved relate to the minimum number of satellites needed, their distribution in time and space, etc. The answers will depend in part on the applications favoured — and on the financing available. Raney, R. Keith, and David L. Porter. “WITTEX: An innovative three-satellite radar altimeter concept.” IEEE Transactions on Geoscience and Remote Sensing 39.11 (2001): 2387-2391. Allan, T., The story of GANDER, Sensors, 6, 249-259, 2006.